Added the Team Pack Rat to the links! WORTHINGTON, Ohio – The WPI/NTPA office is pleased to announce that the Monroe County Agricultural Society, promoter of the Budweiser Dairyland Super National Truck and Tractor Pull event in Tomah, Wisc., has extended its sanctioning agreement with the National Tractor Pullers Association through the year 2011. As the Monroe County Agricultural Society prepares for its 33rd annual event, fans and pullers alike continue to enjoy the enduring relationship between this premier event and the NTPA. Featuring six sessions and two tracks, this pull draws record audiences, year after year. The action returns to Tomah on June 20, 21 and 22, 2008. NTPA Office General Manager, Gregg Randall, said, "We value the longevity of the Tomah, Wis. event’s involvement with the NTPA, and are excited to be sanctioning this great event. The Budweiser Wisconsin NTPA Super Nationals is an event fans mark on their calendar each year, and it continues to grow and thrive thanks to the efforts of the Monroe County Ag. Society. With the Tomah, Wis. and Bowling Green, Ohio events under contract through the 2011 season, the NTPA has the two largest attended outdoor events on their schedule for the next four years. We are proud and honored that these events value the NTPA, its members, its fans and its commitment to the sport of producing high quality events. We will continue to work hard to maintain our level of excellence and to earn that respect." 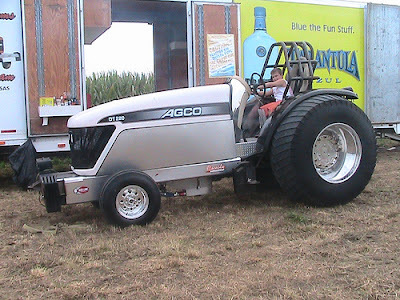 For more information regarding the Budweiser Dairyland Super National Pull, call the Monroe County Agricultural Society at (608) 372-2081, log on to www.tomahtractorpull.com, or e-mail mail@tomahtractorpull.com. For more information about the NTPA, visit their official Web site at www.ntpapull.com or contact the NTPA office at (614) 436-1761. The guys in Dronten are busy! There won't be much left of the former Country Girl tractor after this season. After the chassis rails had been replaced before already, and instead of 4 KBs, 5 New Century engines were supplying the power, they are now working on a new chassis and completely new rearend. The Cat planetaries are getting a 4th wheel in and the new rearend housing was just mad eout of sheet metal. All this to withstand the enormous forces occuring the 4.5t mod class, that had killed the old rearend at the Euro Cup finals in Bettborn. Their little "Jackass" tractor (0.95t mod = mini rod) is also getting a new chassis and with both of their tractors back in good condition, the team will probably once again be a top notch operation in the European circuit. After having playing around with electronically controlled injection the Black Widow Team went back to a mechanical fuel pump. The truck is rpm limited to 2700 rpm and runs in the dutch competition. 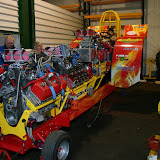 Team Crazy Torque are pleased to announce that they have purchased the De Jong Special from Holland. The deal was done with Twan de Jong on Saturday with help from Tom Jespers translating. The tractor will be running in the 2.5 and 3.5 ton class and should really benefit the british modified class. Finally a weekend with time to do some travelling around. I have been visiting Klemens and Thomas Mathmann to see how far they've proceeded with their new alky burner and take a few pictures. While there, Thommy just arrived with the new hood and we could get an idea how the tractor is going to look like in the 2008 season! The Super Kasper team around the Groenestein bros, who are long time pullers and used to run with a twin Rolls Royce Merlin tractor, have purchased the Red Diamond twin Griffon Machine. 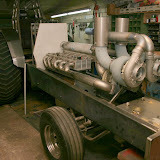 So the tractor will stay in one piece and also the dutch competition. The Viper is sold to the new "LP Lacktechnik Racing Team" from Hilkenbrook / Germany. LP stands for "Laing & Pape", two guys from north west Germany, who run LP-Lacktechnik, a company specialised in painting and powder coating for the industry. This news unfortunatly means the slow exit of Joop Wouters, another pioneer of Tractor Pulling in Europe. Joop started his career in the 70s, relying on V8 engines. In the early 80s he was very succsesful in the 3.5t modified class with a tractor called "Double Trouble". The tractor was pretty up to date for it's time, utilitizing a Ford 5000 rearend with two blown, Hilborn injected 440 Dodges up front. Actually, it was the first European tractor with blown V8 engines, when it roared to a victory at the 1982 Ahoy Super Pull. Numerous championships and victories where achieved. 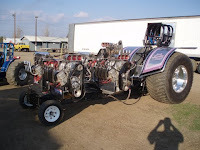 In the 90s Joop came up with a new machine, a new "Double Trouble", spotting a up to date tube frame chassis below the two Dodges and a Keith Black Hemi sitting on top. A few years later Joop again was right on the edge of technology, changing to a wedge chassis with two Keith Black engines on the nose. Lack of manpower forced him to drop out for a while, but with his son becoming the "right age" and bringing in a few of his friends, the "Viper" was reactivated and set up with 3 Keith Black engines. A major set back probably was the destruction of an engine during the 2006 season, which forced the team to change their focus from the 3.5t into the 2.5t class, where they actually did pretty well. They also joined the 2007 2.5t Euro Cup and laid down some nice results in the end. We all had hopes, the Wouters family would now be out strong again, but life doesn't always play that way. His son wants to study, engine parts are not getting cheaper and the competition in the Netherlands and also the Euro Cup becomes more and more of a money game. Joop will still be involved with the new team though, being kind of their teacher for at least the next season. Because a teacher is what they'll probably need with the plans they have. For 2008 they have set their eye on competing in the german championships and the 2.5t Euro Cup, to learn what it takes to go big in the future. To be competetive, they have aquired one complete new Keith Black engine and brought the two Viper engines "up to date" with new parts. Their goal for the next three years, after having gained some experience, is to join the 4,5t Euro Cup and I can tell you, they mean business! 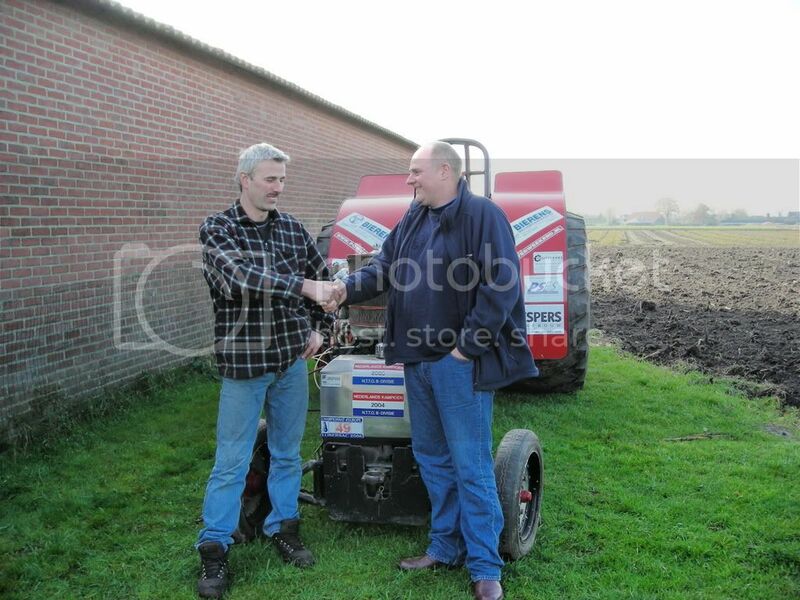 They hope to receive an invitation for the upcoming Indoor Pull at Zwolle, which is very close to home for them, and present the tractor there under the new name "Red Painter". Where the "Painter" comes from should be clear - why "Red" is something I will tell you about next month, when I'll pay a little visit to their workshop. Lidköping Tractor Pulling Club (LTPC) is building a new arena. 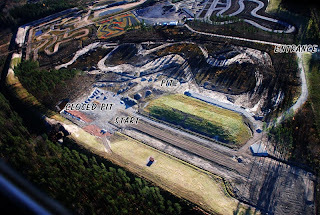 a new area for motor sport in Lidköping. competion at the new arena that can receive 10.000 spectators. Time for an Euro League? I can remember very well voting against the 2.5t introduction into the Euro Cup about a year ago. My concern was, that "big" teams would join into the class if it was held on the Euro Cup level and then ruin the great show the class had laid down with it's variety in the past and also in the 2007 Euro Cup Competition. But ok... majority rules and so be it! The invasion is now coming. In the last season, if people had their eyes open, they could see some teams fold up, that run at the lower and mid range of the bigger national circuits. When my team got to see the schedule for our 2008 season (21 events which equals something like 70 runs on each tractor), we really started to wonder what to do. But the fact we'll have to miss a german pull puts a question mark behind the participation in that series. If we have our stuff running right, the talking behind our backs starts about how we, with "all that sponsor money" (wish it would be that way), beat on the little guys. We with our experience and years of collecting parts, beating on the little guys. Then there is other issues like tracks and infrastructure on the smaller events, plus a pretty time consuming circuit (due to the long distances that have to be traveled). But since the number of Euro Cup competitions is limited to 6 events per class a year, you don't get a full schedule with that series, in case you decide to for running Euro Cup only... and still have to do both and run against the little guys, that don't see much of a perspective. Now I've seen on the dutch board, that the A-Division guys are not too keen on running their competition in a mix with the Euro Cup Tractors, while the other way round, the Euro Cup guys are not happy to have "national" competitors mixed in. Both blame the others for ruining the tracks and screwing up the results. Now.. is it time for a split? Open up the Euro Cup to between 8 to 10 events per class a year. So as team you can decide whether to run the Euro Cup or the national championship. With 8 to 10 events there still is the chance of supporting your local events and do some invitationals, but the pressure in the national series is gone. Of course this will take a few top machines out of the national championships (depending on how many events there are), but I think it will give room for smaller teams to stay alive, develop or get started. I am usually not too keen on spreading rumors (that's why I am not going to post any names), but today I got informed about FIVE (!) teams enterting the 2.5t modified divsion with new twin Hemi set ups within the next two years. I know for a fact that three of them are not rumors and the other two didn't sound far off anyways, as I know the engines (and one rolling chassis) for those projects are there. 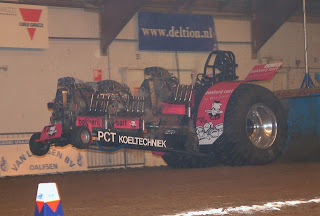 From today on (Nov.18th) Tractor Pulling will be featured on dutch TV weekly on RTL7. The shows will be on at 17.00 every sunday. If you've missed it the first time, a week later on saturdays you'll get to see it again! The times for january are not set yet, but should not be much different from the december times. Don't forget about the sunday pull chat! Sorry to send you only half the story last week. 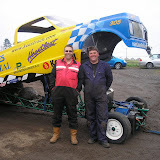 The new owners of Heartbeat are Mark Pacey (The Dealer Pulling Team) and Andy Miller (Bear Essentials Pulling Team). The intention is to get the tractor up and running for the UK competitions in 2008 and also attend some invitation pulls in Europe (providing we can get some invitations!!). We both fancied another challenge apart from the Minis’ and Prostocks so decided to invest in the TWD. Alan Williamson, the former owner, was also keen for the tractor to remain in the UK so he was pleased when we managed to sort a deal out with him for Heartbeat. We are now looking forward to many hours in Mark’s workshop to get it ready for the first event! I’ll send you more pictures as we start getting the tractor together and set up a new website for the team. How much input a simple news release and following discussions can have, could be figured last week. The NTTO had to change it's plans about the future regarding going on without the Belgian competitors. I am not going into the details here, but a new plan has to be laid out. This stuff is waiting for an accident to happen - but looks like fun! Yesterday the Bits'n Pieces team around Willem Veldhuizen and Edwin Derksen has put a new website online, that is just IMPRESSIVE! Since this morning it's also avaliable in english! Check out www.bitsnpieces.nl! As some of you might have seen, I've sorta teamed up with a new website in the USA, called www.pullingdepot.com. Part of the story is, that we'll from now on share one message board, a new classifieds section (from their end) as well as the chat and the pictures (from my end). The way the site is build up, it's rather similar to this one, but more focused on the US scene. We'll probably merge both sites into one in the future (you're not going to miss anything that you are used to from this site) - but we still have to work out some details. For now Pullingworld remains the way it is and we'll see how pullingdepot.com takes off in the US market. Don't want to overload that site with European stuff now. I have updated the 2008 schedule. All DTTO pulls are now shown, as well as some more pulls from France, Norway and the US. Stop by at the DTTO booth in "Halle 8" Section C27. Take a close look on Roude Leiw Junior, check the video presentations, get the new 2008 calenders or simply have a chat with some pullers. Also on exhibition are Dragon Fire at the booth of Kramp and Isotov 2 at Good Year. 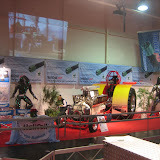 The Agritechnica is the world's largest exhibition for agricultural machinery. The Agritechnica 2007 has started with a record level of exhibitor participation. 2,247 companies from 36 countries, including 2,168 direct exhibitors and 79 additionally represented companies will present a complete agricultural technical programme. The number of exhibitors has increased by almost 40 percent since the last event in 2005. There is a little story about this video. The boy featured in here has cancer and his biggest dream was to once pull a Super Stock tractor. His dad is a hot farm puller and together they worked on his dream and this video shows about his very first run with the tractor. ESPN2’s coverage includes 12 half hour shows that will air at 11:00am Sunday mornings (www.ESPN.com). Available to approximately 88 million house-holds nationwide; ESPN2 is part of the largest dedicated sports network in the world. ESPN2 can be found on DISH Network (Channel 144); DirecTV (Channel 209), Cable subscribers please check your local listings as stations will vary. In addition to ESPN2’s schedule, there will be 5 one-hour shows airing on VERSUS, which begin airing on February 16th @ 7:30 pm (www.VERSUS.com). VERSUS coverage will kick off with the events from Hillsboro, WI and will include events from Owensboro, KY and Terre Haute, IN. The VERSUS network is among the fastest growing networks in the country, currently available in over 73 million house-holds. To check out the Lucas Oil Pro Pulling League on VERSUS, go to DISH Network (Channel 151); DirecTV (Channel 608), and once again Cable subscribers please check your local listings as stations will vary. New for 2008, MAV TV (www.MavTV.com) is joining the party and will offer up 2 hours per week of Lucas Oil Motorsports coverage. In addition to the 2 hours of “Lucas Oil Presents” Prime Time TV coverage, MAV TV is also launching a series of new media ventures such as MavTV.com Broadband. It will boast the capabilities for anyone with a broadband internet connection to watch streaming “Lucas Oil Presents” motorsports action from anywhere in the world. Also, from MAV TV, a new program scheduled to launch by the end of the year, JOOST promises to be the premiere Peer-to-Peer (P2P) video delivery service, which MavTV will have dedicated “Lucas Oil Presents” program content available to view. The Lucas Oil Pro Pulling League is owned by Lucas Oil Products and supported by several corporate business partners: Dixie Chopper, R&L Carriers, Torco Fuels, General Tire, Summit Racing, K&N Filters, KC Hilites, Super Chips, Jim Beam, Fatheadz Eyewear, and Super Clean. In 2007 the series will receive over 60 hours of prime television coverage on cable sports giants ESPN2 and VERSUS. 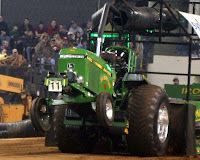 For more information log onto www.propulling.com or call 812-216-4024. Some pics of the first pieces for the new Green Fighter! 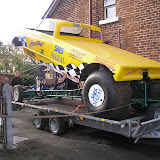 They have built a new forum down under, supported by the ATPA (Australian Tractor Pulling Association). Hopefully it will turn out into a source of info about Pulling down under! After countless attacks of a certain group of posters, trying to really pi** him off, he has now closed his very popular Pull Off message board. I for one hope, Jake can find the will to continue, as the Pull Off Forum was daily lecture for me. They start to move things forward in Albersloh! Saturday the 29th of December a Diesel Power Fair is held at the 'manege Diamanthal' in Balkbrug (ov) in the Netherlands. At this fair you can see various tractors from the pro, superstock and tractorpulling sports class. All the tractors have there hood open so you can see the Diesel tuning technique they use for their tractor. Many of the owners will show broken components and sell components that they don't use anymore. 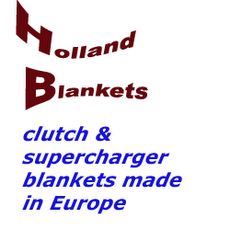 There are also stalls which sell turbo's, fuelpumps, airfilters, tyres, fire resistent clothing, aluminium rims and many more items relating to tractor pulling. The Diesel Power Fair is open from 13.30 - 21.00 at December 9th. Now that I have the Euro Cup dates, I have started on the 2008 schedule. Those of you who have more dates, please send me an Email to pullingworld@gmail.com! The Aussies are showing us what can be done! We all know the Rover Meteor engine and how poorly it performs at times. Now the Riverina Screamer team has not only fitted an EFI on it, but also put 2 camshafts in each head! As just stated, the two dutch associations NTTO and ITTC will merge into one association. After almost 25 years of running their competitions against each other in the southern part of the Netherlands they have finally agreed on building a new competition series together. In fact that means the current "B-Division" will undergo some changes: Having been a combined championship of dutch and belgian teams and events in the past, it will now only be a dutch series, with the dutch B Division and ITTC competitors combined. This will add quite some spice to the B Division in Pro Stock and light Modified competition. Added to this competition series will be the Semis, which are currently growing strong in the Netherlands and have so far pulled some with the S-Division. For the future the NTTO is planning on introducing another top series on top of the A-Division, which will then result in a dutch competition in an A, B and C "league" for the major classes. The current S-Division (Hot Farm) will remain untouched.